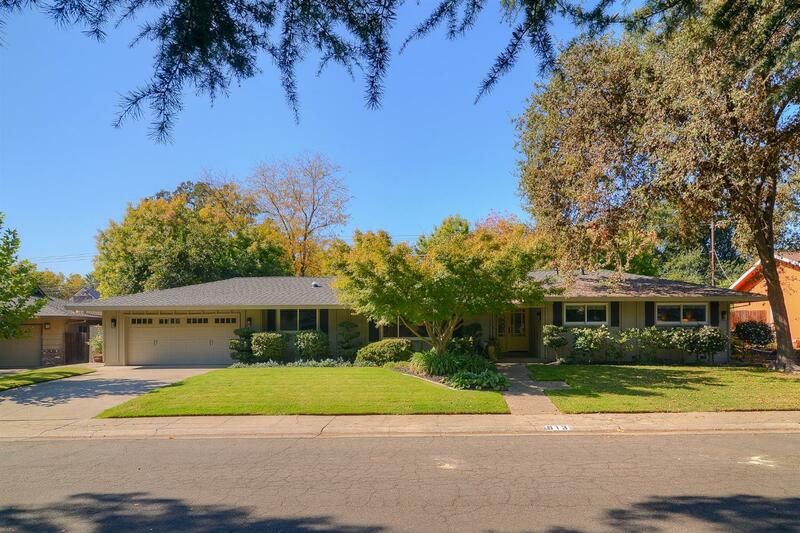 One story sophisticated and remodeled Arden Park home offers many custom upgrades: Wood floors, crown molding, high baseboards, wood clad dual pane windows, gorgeous quartz bathrooms, fireplace mantels and recessed lighting throughout. Three bedrooms, plus a den that was formally a bedroom, and two stunning bathrooms with Quartz counters, custom cabinetry, including drawers with interior outlets. Plus a half bathroom for guests. Formal living with a gorgeous wood surround fireplace and picture window. Large formal dining room is ideal for entertaining. Granite kitchen with stainless steel appliances and a breakfast nook that opens to a family room with a fireplace. Beautiful, serene and private backyard with a natural stone waterfall, mature landscaping and patios. Extra deep 2 car garage with high end storage cabinets, plus a potential RV area. Large laundry room with extensive storage. Presidential composition roof with skylights installed approximately 3 years ago.